So this promotional comic from 1982 is exactly what it looks like: A Spider-Man adventure in Dallas set during Christmas! It seems a local millionaire is hosting a charity event, to be attended by many more millionaires. For some reason, The Kingpin (who is of course very rich himself) decides to travel to Dallas to rob this event. Unfortunately for him, J. Jonah Jameson was invited, and he's dragged Peter Parker along with him for photography. 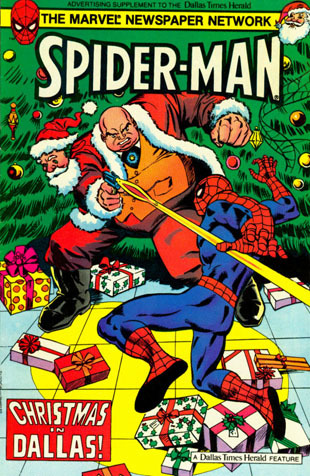 Do you think Spider-Man can defeat The Kingpin (disguised as Santa) with the help of a millionaire inventor? Probably! As Sense of Right Alliance points out, the best thing about this comic is the ads that local businesses paid to run along with it. All of them, no matter how weirdly incongruous it is, went well out of their way to imply a connection between their business and Spider-Man. You can see them here. By the way, isn't it quaint remembering a time when a wealthy inventor only had to be a millionaire? Merry Christmas!